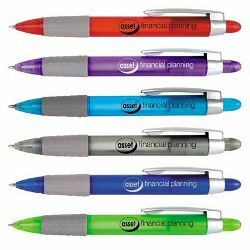 Push button plastic pen with rubber grip. ITEM SIZE(MM) 139L x 13Dia. PRINT AREA(MM) Clip - 35L x 5H or in shape of clip, leave 1mm from edge (See line drawing), Barrel Side - 55L x 8H. COLOURS Red, Dark Blue, Green, Grey, Light Blue, Purple.